The sun is generally the source of life on the earth. Its rays are so important for the well-being of both plants and animals. Apart from being used as a source of light during the day, the sun’s rays can be stored to provide lighting during the night and in dark areas as well. The solar lantern is built with photovoltaic cells that absorb the sun’s rays during the day, charge batteries which are then used to provide light during the night. For maximum operation of the lanterns, they should be placed in areas with at least eight hours of sunlight in a day. Solar lanterns are becoming more popular with time among outdoor adventurers. They really come in handy if you are planning to dry camp. This has led to the production of so many of them under different brands. With this influx of solar lanterns, it is becoming challenging to choose from the varieties that are available in the market. We now invite you to take a thorough look at best four products you are likely to come across in the market. The YIEASY solar lantern doubles up as a flashlight at the same time. It is uniquely designed with a stainless-steel handle and an ABS plastic material that is of very high quality. The handle can be used as its stand on the table and for hanging purposes on the wall. 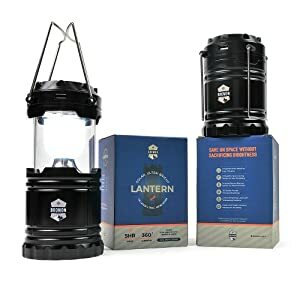 This lantern can be used for outdoor purposes as a flashlight like when camping. For this reason, it comes with a side handle. The switch button is what is used to power it on and off. Adequate sunlight is what you need with this lantern. There is a solar panel on top that is excellently placed to tap the sun’s rays. This makes it environmentally friendly and by extension convenient. The bulbs are low-powered and are capable of providing very bright lights within 360 degrees. The batteries are in-built with capacities of 800mAh. A 5-volt DC cord is enough to charge this lantern for a maximum of three hours. Charging should, however, be avoided in high-temperature conditions. Its collapsible design makes it compact and easy to store. The handles are pulled up once the lantern is to be used. Its light weight makes it portable and easy to carry to whichever place you would like to take it. Adjusting the brightness and even shutting it off is just a simple push away. It comes with a USB port that can be used to charge only android phones. It can be used for emergencies when there is a power outage and outdoor activities such as fishing, camping and hiking or even as a flashlight when having a walk at night. Collapsible handles make it easy and compact to store. Versatile and can be used as both flashlight and lantern. Being solar-powered makes it environmentally friendly. Can be multi-charged by solar or through DC power. The low-powered bulbs are bright. A simple push of the switch to turn it on and off makes it easy to use. The collapsible handles make its use possible in different positions that are on tables and walls. No harmful emissions emitted by this lantern make it eco-friendly. The plastic material is not strong enough and might break if the lantern accidentally falls on the floor. Might explode if the charging voltage is exceeded or done in high-temperature conditions. This is the second best product that you can buy if the first one does not suit you because of one reason or another. This may be because the top pick product is too expensive, too complicated or even too heavy or any other reason whatsoever. This solar lantern will act as a perfect alternative to the YIEASY Led Camping Lantern. 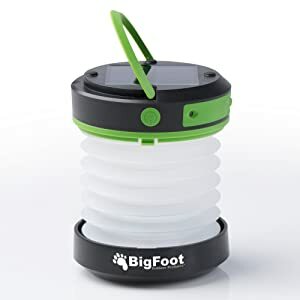 The Bigfoot solar lantern has been specifically designed for outdoor activities such as mountain climbing, hiking and trekking. This solar lantern is lightweight and therefore efficient for such kind of activities. It is small and compact, and you can simply attach it to the carabiner before hooking it up on the backpack and walk freely knowing that it will charge throughout the day. This lantern eliminates the need for disposable batteries that end up being harmful to the environment. A single charge is enough to keep this lantern for over ten hours with three different lighting modes that are high, low and SOS. This solar lantern can be charged via solar just as the name suggests or through a USB port. It has a power bank that has a battery which is rated 800mAh/3.7V. This battery is a rechargeable lithium ion type. This is large enough to power USB devices of different kinds. Full charging by an external adapter takes between four to six hours. It is lightweight and small, thus making it easy to carry. The compact design makes it easy to store. A versatile solar lantern as it can be used to charge USB devices apart from being used as a source of light. Has three different lighting modes (high, low and SOS) which can be used depending on the lighting conditions of the place you are in. The in-built rechargeable lithium-ion battery makes it eco-friendly since there are no disposals into the environment. The ultra-thin plastic casing is not strong enough making the handle break faster than expected. Some might fail to charge after some time. The CMB Solar Lantern is available at a relatively cheaper price. Its relatively affordable price qualifies it to be considered as a budget product, but that will never compromise on its performance. 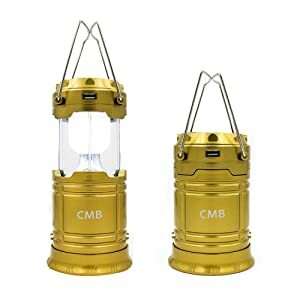 Just like most solar lanterns, the CMB lantern has a built-in solar panel and rechargeable batteries. Apart from the solar power, it can be charged by DC power as well. It can provide light up to a maximum of 12 hours due to its energy saving properties. The light provided by this lantern is bright compared to the 30-LED ones. The built-in power bank that has a USB port can be used to charge mobile phones as well. This is a perfect tool for outdoor activities such as hunting, hiking, fishing and camping. It works as a handheld flashlight as well. The collapsible handles make it easy to suspend and even more portable. Furthermore, these collapsible handles make it easy to store when not in use since it will occupy a small space. The separate handle and the switch placed at the bottom are what is used to convert it into a flashlight. The two modes can, however, be operated simultaneously. Some of the other important features of this solar lantern are the water-resistant plastic casing which makes it even more long-lasting. Its lightweight makes it even much better to carry for outdoor activities. The multi-charging property makes it convenient as you can change the charging mode depending on which one of the two is available. The water-resistant plastic casing makes it durable. Versatile as it can be used both as flashlight and lantern at the same time. The collapsible handles make it easy to suspend and even store when not in use. Its lightweight design makes it easy to carry and hence portable. The built-in rechargeable batteries are eco-friendly since they are not disposable. The inbuilt power bank can be used to charge other USB devices. This solar lantern is cheap and therefore affordable. You might experience few problems with the USB port such as refusal to charge some phones. If you feel somehow financially capable, this is the best product that will offer you the best services and is available at a slightly higher price. It is the best product at the higher price range. With the Browon solar lantern, your outdoor adventures have been made much easier already. The solar panel has been attached to the LEDs that provide brightness in all directions, which is 360 degrees. This will be ideal for providing light in your tent. The backup 3AA batteries are rechargeable. In case of emergencies and you need to charge some USB devices such as your mobile phone, the USB port on the solar lantern will be of much help. The outer casing is water resistant making it more durable. This feature also allows you to use it even when it is raining or in wet areas. The collapsible outer-shell makes it easy to carry and transport. You can use the folding handles to set it in a position that best suits you. The telescopic positions are meant to control its brightness levels. This allows you to see far enough into the darkness when in the wilderness. Lightweight and collapsible body for ease of portability. Long-lasting due to its waterproof outer shell. The folding handles can be used to hang it in positions that will give the best lights for your use. Its USB port can be used to charge other USB devices such as mobile phones. Going green as with this solar lantern is eco-friendly. Does not illuminate a wider area when used as a flashlight. 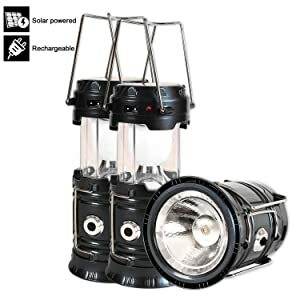 Perhaps you are asking yourself the point of going through all the trouble of looking for the perfect solar lanterns while you can simply use other ways to provide you with light while camping. There are many reasons why you should opt for solar lanterns over all the other means of lighting your campsite in the wilderness. Eco-friendly- Solar lanterns are very safe to the environment. In this age where global warming effects are increasingly being felt day after day, it is only wise if we could engage in practices that conserve the environment before all the ice melts and sea level rises. Versatility: These lights will enable you to enjoy several functionalities from just a single product. Even though they are mostly used by campers, you can still use them to light your homes in case of a blackout. They can be used as torches as well. These are functionalities that you cannot enjoy using the other lighting methods from a single product. Safety: Sincerely speaking, solar lanterns are very safe to use. This is because they lack cables and will reduce chances of electrocution and even fire. While they may not help you heat your tent, they are not operated using any flammable fuels that if handled carelessly can be a fire hazard. This will make sure that you are always safe when using them at the campsite. Cost-effective: The process of operating solar lanterns is very easy. You will not be required to buy any fuel or batteries to operate them. All you will be needed to do is placing them in a position where they can be charged using the heat from the sun. Basically, after buying a solar lantern, you will never worry about any additional costs. Having considered some of the best products, it is now important to know some of the features to look for in a solar lantern before buying or recommending one to your friend or family members. These features will save you the hassle of having to go through the products one by one. You will end up finding your perfect match within minutes. Some of these properties are discussed below. Most people prefer very bright lanterns but are advised that some consume a lot of power and may end up drained after a few hours of use. This might inconvenience you especially if it was meant for outdoor activities. It is advisable that you buy lanterns that use LED bulbs as they consume less power. Lanterns with many brightness modes will also help you save on energy consumption. This is possible when for example you put it on the dim mode when the light is not that necessary. Multi-modes also help in prolonging the battery life. However, if you can find a lantern that has a constant brightness but saves on energy to give you longer illumination hours then do not hesitate to try it out. Most solar lanterns are fully charged in eight hours. However, there are others that might take longer. Weather can also at times be unfavorable to charge the lantern for example during winter. As much as these lanterns are primarily built to be charged by solar, having other charging modes is very necessary in case of emergencies. Use of other power sources such as disposable batteries, DC and AC power is very ideal. Always look out for lanterns with multiple charging modes. If you plan to use your lantern for outdoor activities, then the quality of the body is a very important aspect to look into. You can always trip and fall with the lantern, and if it is of low quality, it will break down, and you will be left in total darkness. Lanterns which are water-resistant will last longer and if you come across them, then do not hesitate to purchase if it meets all your preferences and needs. Other build features to look for are sturdy hanging handles and collapsible bodies. Solar lanterns that can be used for multiple purposes are the best! There are solar lanterns that apart from working as lanterns can double up as flashlights. Such lanterns can be very helpful during night walks. Others have power banks with USB ports that can be used to charge other USB devices such as mobile phones. When shopping for a solar lantern, look for one with 5-volt DC ports at either 1A or 2.1A. The ports will be of great help in cases of emergency power outages or when you go mountaineering or camping. Most people normally don’t bother considering the price when buying various products. This is not right; the price plays a very important role in determining which product you should buy. In the case of solar lanterns, the same principle still applies. The most expensive solar lantern will not necessarily meet all your needs. You can still find a moderately affordable one that will serve you beyond your expectations. The best product should strike a balance between price, quality and performance. If you find a cheap solar lantern that performs exceptionally well, you are justified to buy it. Of all the four reviewed products, the YIEASY LED Solar Lantern stands out to be the best solar camping lantern. Its versatility makes it perfect for both indoor and outdoor activities. Its LED bulbs are low-powered and can illuminate in all directions besides having multiple charging modes. Its collapsible, lightweight and compact design makes it much portable and easy to transport. You can adjust the brightness level making it possible to save on energy. The USB port that it features can be used to charge other USB devices. These features plus much more make it the best of all. I would, therefore, like to recommend it for you. You can give it a try, and for sure you will not be disappointed. I hope this article has been of great help to you. Have you ever used a solar lantern when going for an outdoor activity? Which brand of the solar lanterns have you used before? Do you intend to buy any of the brands that we have discussed above?